If you have a hankering to switch from a consumer to a producer in the world of websites, you’ll need a hosting service with experience in all the facets of website hosting and support. iHost.com has already passed the one million mark in the number of sites it supports, so you won’t have to worry about how experienced they are. Our review has persuaded us that the company provides quality service at a true, bargain-basement prices for new and existing website owners who would like to leave the driving to someone else, while focusing on content and their own customer service. The firm hosts business, personal, social, and non-profit websites, and has been in the business for over ten years. The world of websites is hardly much older. The company has learned in that period that like snowflakes, no two website operations are alike. As a result, they have built a great deal of flexibility and versatility into their system, allowing them to produce and manage highly-tailored sties for their clients. The firm’s services focus on three area; websites, email, and online security. Starting with their flagship website support, the firm supports online site building, as well as software such as Expressions and Dreamweaver, along with blogging applications and even code writing with HTML. Novice site owners are provided with a quick start guide and tutorials, and the firm’s central site builder offers over 100 templates. Each template, of course, serves only as the starting-point for your customized site construction. Web-savvy customers will have available to them as well over twenty scripts and applications, and the firm partners with industry leaders, including Google, Verisign, and ShopSite to ensure security and stability. With so many of us becoming makers as well as partakers on the Web, we decided to take a closer look at the firm in order to assist our readers with an in-depth evaluation of this leading website hosting service. 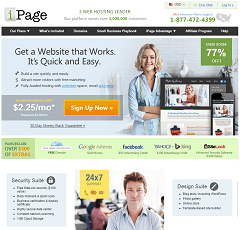 The company’s flagship product is the iPage Essential Plan, its basic-level website hosting service. If we didn’t tell you it was their basic plan, however, it’s likely that you wouldn’t guess, given the wealth of features it provides. This essential hosting solution includes beginner-ready tools that can be used to build and design your site. And the firm doesn’t leave you alone in their virtual playground – they provide tutorials and extensive step-by-step guidance (involving their simple-to-use “install wizards”) as you swing through the process of selecting each of the elements that best serve your website needs. These website construction choices include one-click installation of photo galleries and blog software. The firm also provides free domain registration, free Site-Lock security suite, a free online store, a free script library, a solid support service, and outstanding reliability. Their hosting technology is based on network infrastructure that uses a pooled server environment, giving virtually any server on their network the ability to access your website files when a request occurs. The result is that outages driven by a traffic surge will be a thing of the past – or at least a thing of the past for iPage clients. The firm even supports your blog marketing activities, by providing up to $250 in marketing and advertising value to new members through Google and Yahoo! The firm provides clients with one gigabite of free cloud storage from JustCloud for use for your documents, photos, music and videos that are stored on your computer. This will enable you to reach these documents anytime, anywhere, and from any device. That’s what we call freedom and mobility. This is a company that is dedicated to preparing you to be a company. For that reason, their website support service includes full support for your own online store. They offer a range of tools that can be used to enable you to sell online. These include shopping carts, catalogs with coupons, and sales options. They even offer PayPal integration and the ability to accept credit cards online. This really will allow you to become, as they say in the Army, all that you can be. And when it comes to the separate service of email support, the firm offers the ability to customize your email address by including the name of your domain on the address, permitting you to enhance your professional image. As for the firm’s security suite, it is comprehensive, including business verification, daily malware scans and spam scans, a display certification for your iste, a highly secure data center, and constant network scanning. The key price to remember when considering iPage is $2.25 per month. That is the ongoing price for providing hosting support to your website. An order of pancakes at MacDonald’s costs more, and that’s without the sausage, hash browns, or coffee. The firm’s comprehensive security suite is offered to you free as part of their introductory offer, though you will need to keep track of when the introductory offer expires and the amount you’ll be expected to pay thereafter. 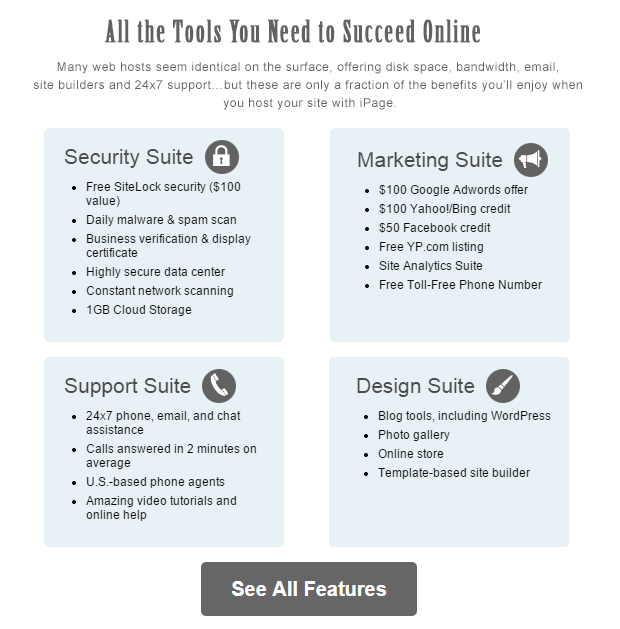 The marketing suite that they offer includes $100 in Google Adwords, and another $100 in Yahoo! Credit, plus $50 in Facebook credit, along with a free YellowPages listing, site analytics software and a website authentication seal. All of these are free. The support suite that they offer is also free, and this includes their 24/7 support with a promise of calls being answered within two minutes, North American agents who speak your language, rigorous Quality Assurance testing, and tutorials and online help. Please note that all these prices are introductory, and that they will automatically renew at the regular rate – so you will need to confirm that rate before you move forward with them. The firm has made the substantial investment necessary to support 24/7 tech support for all of its North American customers. You will be able to interact with support staff by email, chat, or telephone. They also offer a massive knowledge base that extends to hundreds of articles on website building and maintenance, a user guide that will tell you all you need to know about your website’s functions, and of course their terms of service. There aren’t many complaints, although there were a few from customers who were surpised with those free introductory offers ended and the regular pricing kicked in for certain of the firm’s services. That’s why we are emphasizing the need to check on those prices from the onset. 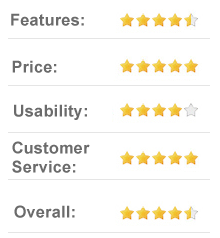 Most of the customer feedback we were able to track down, however, offered expressions of thanks, including from numerous website operators who experienced growth in their traffic after signing on with iPage.com. We don’t have to just imagine that having such strong technical and functional support is the reason why – the customers themselves said so. We are migrating our businesses, steadily but surely, onto the Web, and most of us are not technical wizards. As a result, it is critical to find the right website hosting company to support your online operations. From blogging to providing contracting services, and on to offering your own online store selling merchandise, whichever form of website you may wish to host will be very well supported by iPage. Having your domain name, website design and build, email, and security services all provided in a one-stop, turnkey solution is an ideal way to move forward with website operation. And the added advantage of cloud-based server support, which essentially guarantees that your operation will not crash as the result of a traffic surge, is the cherry on top. This is a company whose services we can highly recommend.